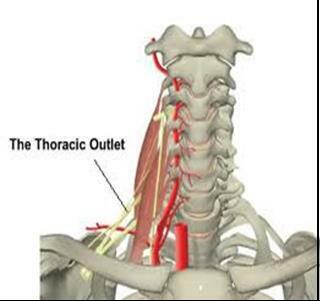 The thoracic inlet allows unobstructed passage of the neurovascular bundle (nerves, arteries and veins) from the root of the neck to the axilla (from the neck to the arm pit). Signs and symptoms of thoracic inlet syndrome occur if there is some restriction of the passage of the neurovascular bundle between the shoulder and the neck. There are many factors that may be involved, including tight neck muscles or abnormal muscular attachment onto the ribs, cervical ribs (either calcific or fibrous), or postural causes. The patient will normally present with numbness and pins and needles through one or both arms. Neurological symptoms (pins and needles and pain) predominate in 90% of people and vascular in 10%. They may also complain of incoordination, muscle weakness and pain particularly in the hands and fingers. The symptoms are generally worse with sustained overhead activity and positions. It is quite common in weight lifters and carpenters, or in people who are overweight or with very poor posture. What is observed depends on whether there is a predominance of vascular or neurological causes. Typically one will observe some form of numbness, muscle weakness and in the later stages, wasting especially of the intrinsic finger muscles and thumb muscles. If the cause is primarily vascular a decrease of the radial pulse may be felt in sustained shoulder abduction, a blush discolouration in the hand when down by the side and venous symptoms may also be present such as oedema (swelling). Physiotherapy treatment will address faulty neck/back postures and joint mobility with mobilising of joints and posture correction exercises. Tightness of neck musculature, in particular the scalenes, can be decreased through stretching and retraining of shoulder girdle muscles. The stabilising muscles of the neck and thoracic spine (such as longus colli, lower trapezius and serratus anterior) are also retrained and strengthened. Modifying household activities and exercise routines is important for positive long-term outcomes. Initial manual physiotherapy can speed recovery and is best combined with a prescribed home exercise programme. Results from conservative treatment can be very successful with 70-90% resolution of symptoms.